Purpose: To compare the outcomes of Abdelhamid technique in treatment of inguinal hernia to conventional TAPP with mesh stapling, Prolene hernia system (PHS) and Lichtenstein repair. Surgery is a medical specialty that involves operative techniques to investigate or treat a pathological condition or to repair unwanted ruptured areas. 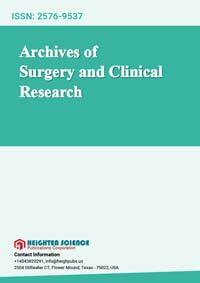 The foremost aim of Archives of Surgery and Clinical Research is to publish manuscripts exemplifying the importance of surgical responsibility in ensuring and directing patient safety. According to a study, more than 200 million surgeries are performed worldwide each year. However, recent reports reveal that adverse event rates for surgical conditions remain unacceptably high, despite multiple global patient safety initiatives over the past decade.